The annual Lead Belly graveside memorial jam will be banged out at noon on Sat, Nov 7, about noon at the Shiloh Baptist Church graveyard in Mooringsport, Louisiana (10395 Blanchard Latex Rd, Mooringsport, LA 71060-9150), says Katy Hobgood Ray. 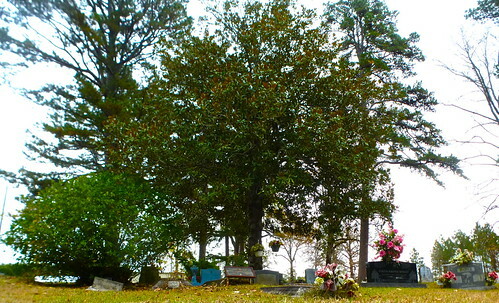 Louisiana musicians will gather at the grave of Huddie “Lead Belly” Ledbetter to perform his songs from noon - 1 p.m. All are welcome. Kathryn Hobgood Ray, 504-650-1238, kathryn@bienvilleray.com or Danny Wilder, 318-751-2733. The drive to Shiloh Baptist Church traverses some of the lovely woods of North Louisiana. The route also passes the Longwood General Store and Mobil station where drivers can fill a tank and fill numerous hungry bellies. Take I-20 Exit 3 (LA -169), North 10 miles to Caddo Parish #6. 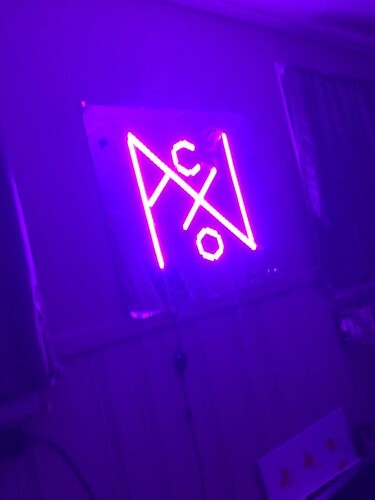 (a.k.a. Blanchard-Latex Rd.). Turn left on Caddo Parish #6, drive 2.6 miles to Shiloh Baptist Church. Voces Castellanas and Multicultural Center of the South happily invite you to the Day of the Dead Festival, says Janine Gomezjurado Demerath. 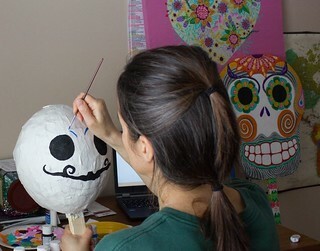 Día de los Muertos, A Celebration of Life, takes place on Sat, Nov 7, 1:00 to 4:00 pm at Columbia Park. "Bring your family to do hands-on crafts, enjoy music performances, folkloric dances, exhibition of ofrendas, face painting, Bread of the Dead, games and more. Admission is free," says Lee Spruell. Photo Julia Miranda Bonet 2015. Harriet Stone Evans loves math. She also is an accomplished designer and painter. Thus the exhibit of her work, “From Flowers to Form: Art Inspired by Mathematics,” will illuminate the mathematical elements in art. 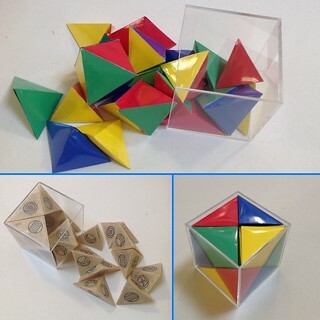 Viewers can expect to experience the power of geometry and algebra as artforms through Evans' artworks. And most of her work is interactive. The Evans exhibition has been presented at the Museum of Science in Boston and the Louisiana Children’s Museum in New Orleans. "Aerial flyers, acrobats, contortionists, dancers, jugglers, balancers, and strongmen," says Cirque de la Symphonie, are what audiences can expect on Sat, Oct 31, in Cirque's performance with the Shreveport Symphony Orchestra. Indeed, "Each artist's performance is professionally choreographed to classical masterpieces and popular contemporary music in collaboration with the maestro." 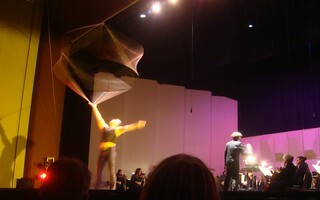 Cirque performed to acclaim in Shreveport in 2009. The SSO audience seemed awed by the variety and high quality of the circus performers. Making sure not to ignore that it is Halloween, the SSO says "Join us at 6:30 PM before the concert for some Halloween fun: face painting, Halloween-themed carnival games and treat bags for kids. We invite kids and adults alike to come in costume and join us for a costume parade." Because you never know when parking on the riverfront is going to be a hassle, there's a free shuttle service which starts at 6:30 pm. The bus picks up at Regions Bank parking garage at the corner of Milam & Market Streets. Pianist, composer, and improvisatory artist Steven Termini will visit Centenary College of Louisiana on Tues, Oct 27, says Gale Odom. 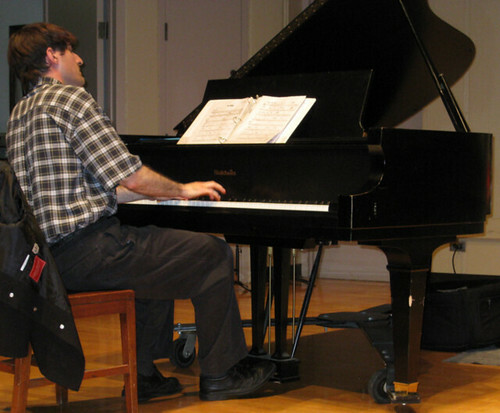 He will perform a concert of improvisatory piano music in the Anderson Auditorium at 7:30 PM. The concert is free and open to the public. Prior to the concert, Dr. Termini will conduct a workshop with Centenary’s new improvisatory student ensemble, Genesis Jam, at 6:00 PM. “Being able to improvise well is a rare skill, but there is an increasing need for that skill in today’s musical world,” said Dr. Odom, Dean of the Hurley School of Music. Dr. Termini earned his Ph.D. in Performance Practice from the Royal Academy of Music in London; he also holds a Masters in Fine Arts (Jazz) from California Institute of the Arts and a Bachelor of Music degree from the University of Texas at Austin, said Odom. More at centenary.edu/news/. Those who attended the Shreveport Symphony Orchestra concert featuring pianist Gabriela Montero will remember that she touted her encore as a breathless moment of improvisatory freedom. She asked for audience suggestions for her theme and stopped when she heard the crowd pleaser "You are my sunshine." I am not so sure that it was a spontaneous, unrehearsed bit. Still, she ran a lot of scales and dazzled the crowd with her knowledge of stock material. She approached the famous melody from several directions and won more applause. As a jazz buff, I was not impressed with what she played for the SSO audience. Then again, how can you play something interesting for a middle of the road audience in a tertiary city? Surely Termini, performing in a quiet, academic setting, will set his sights high in regards his extemporaneous adventure. One hates to say that a dynamic performance of classical music by professional musicians is "free." In so many ways, the word "free" is a sickly and false word. 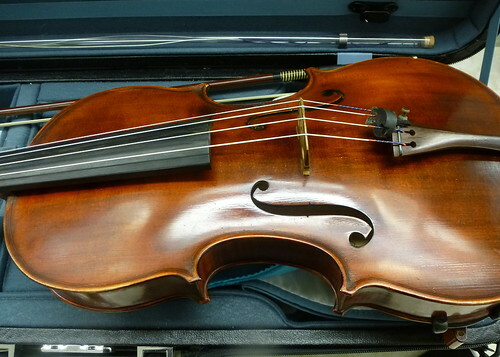 A better description of the Noel Foundation Chamber series on Sun, Oct 25, 3 PM, is no charge. The fees for the Shreveport Symphony production have been paid by the foundation. The concert features Debussy/Schoenberg, Prelude to the Afternoon of a Faun, Schoenberg's Transfigured Night and Strauss Jr./Schoenberg, Emperor Waltz, says Lois Robinson. In the chamber orchestra: Matt Albert, Jennifer Carsillo, Rachel Bundy, Russell Lewis, Todd Gabriel, Sherri Fleshner, Charles Regauer, Ruth Drummond, David Jankowski, Belinda Viesca, Christopher Allen, Tim Wright, Sally Hundemer, Theresa Bridges, Chan Teague and Gay Grosz. A unusual note is that Daniel Ley will play harmonium. The last accompaniment by harmonium that I remember is when Allen Ginsberg played a portable harmonium while reciting poetry in the Shell amphitheater at Centenary College. 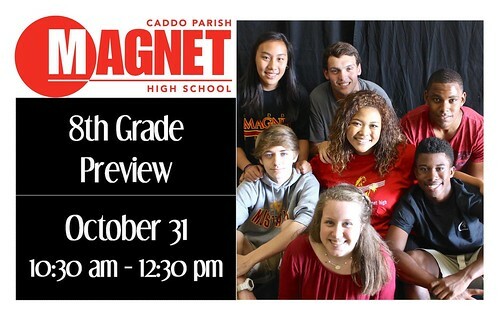 Caddo Magnet High might be a good fit for you. It is a medium-sized school with enough students (about 1100) to provide a variety of course choices (for instance, I teach African-American Studies, Fine Arts Survey and Video journalism as well as world geography) yet small enough to feel comfortable. It has a wealth of sports - lacrosse, volleyball, fencing, gymnastics, tennis, cross country, soccer and more - and the ROTC program provides a world of additional choices - such as orienteering and activities in Rangers. Magnet is known for the academic tone of its campus as well as its friendliness and acceptance. Yet there are small worlds within the campus: among them the drama family, the theater tech group, the orchestra students, the Quiz Bowl teens, the debaters, the band musicians, the Student Council workers. Magnet teachers give individual attention to their students before school and after school. Actually, it is a school where the average student submits their homework on time. Yet across the school students are helping each other study and cooperating to make their deadlines. Please visit the campus and meet students Sat, Oct 31, Halloween, between 10:30 and 12:30. 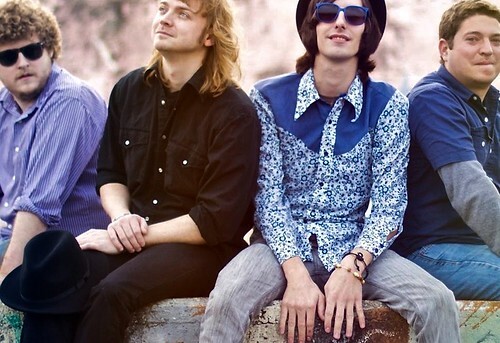 If you arrive later, you may check out Magnet's newest music and food fest, JAMbalaya ($8). Regardless of the time, if you'd like to visit, we'd like to make it happen. Please call assistant principal Sheryl Thomas, 318.221.2501, to schedule a visit. And there's a French Dinner, avec les grands fromages from the Embassy. Highland Restoration Association and Shreveport Green are gathering Highland neighbors for a morning of beautification, says Stephen Pederson. "We will be picking up trash at and around Highland Park," Pederson says. Perhaps more importantly, "We're also planting 30 trees to help replenish Highland's aging trees." Highland chef extraordinaire Andrew Parsons will serve up a delicious lunch from 11 until noon. 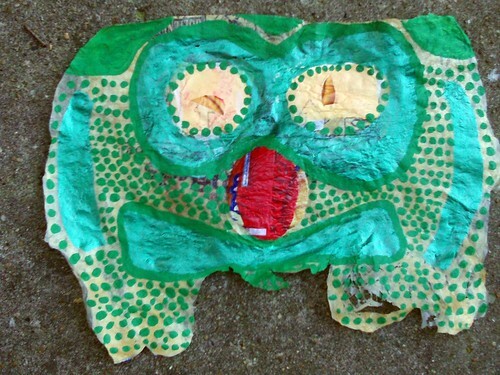 Illustration: mask made from Highland trash by Kathryn Usher. Shreveport Farmers' Market will open on October 24 for its fall session, says Noma Fowler-Sandlin. It will run each Saturday from 8 a.m. until noon through November 21. 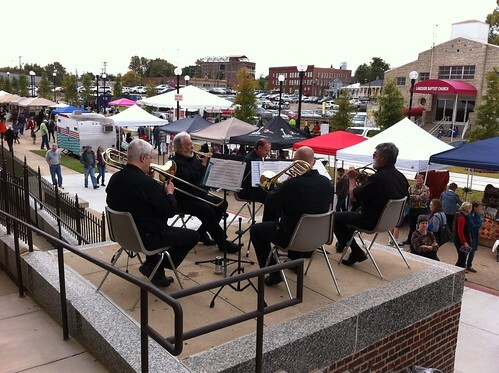 Under the East Pavilion in Festival Plaza, at 101 Crockett Street in downtown Shreveport, there will be a large selection of locally-grown fruits and vegetables, locally-raised meats, gourmet, baked and canned goods. No medical marijuana, but just about everything else. At the Market Cafe under the Spring Street Bridge, various types of ready-to-eat foods will be available, along with tables at which to dine while listening to music performed by areated musicians. "Y'all, what the af is going on?? We're charting now?!" says Chris Rimmer of Hydrogen Child. "I Know" is listed at #12 in Spotify's US Viral 50 and is 18 in the Global Viral 50. Little do listeners know what rich tunes they are about to discover if they follow a purchase of "I Know" with more from Hydge, masters of the pop hook. 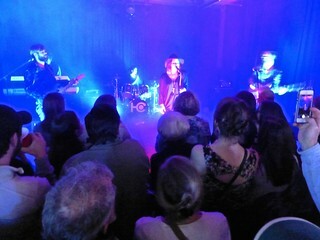 Strange Brew is a salubrious room for a performance of the quintet's arena-sized tunes. 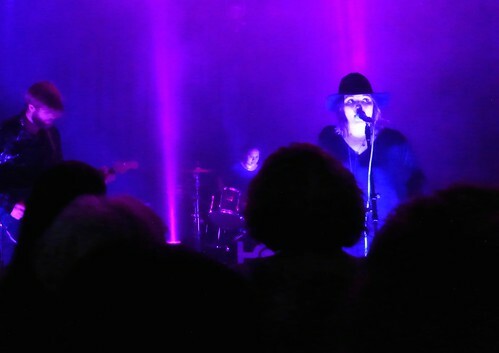 On Halloween they will perform at Shreveport's capacious Strange Brew along with Seratones and, Ansley Rimmer says, "a wonderful group from down south - Lafayette - called Rareluth." 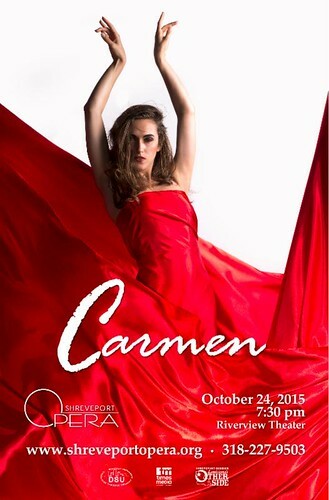 The 67th Season of Shreveport Opera: Bizet's Carmen on Sat, October 24, 2015, at 7:30 p.m. at Riverview Theater, 600 Clyde Fant Parkway in Downtown Shreveport. 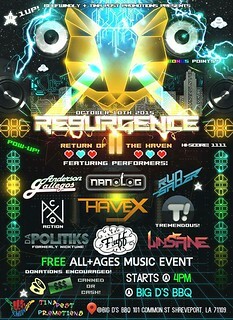 Tickets: $25-90 and $15 for students. 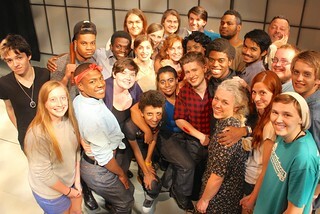 (318) 227-9503 or shreveopera.tix.com. 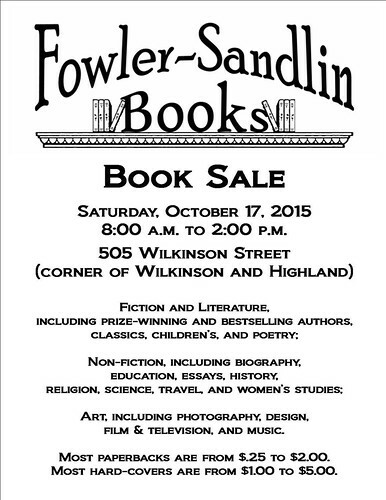 Chris Fowler-Sandlin is the kind of knowledgable, passionate book seller who was more common in a recent era. Trust his judgment on books. Bring your own 10X10 tent and tie downs, says the Texas Ave Community Assoc. Squares are $55 and $75 at eventbrite.com. "Vendors new to the Fair or pre-2014, please e-mail 4 or 5 representative photos and a brief description to makersfair@texasave.org We hope to make sign up a smooth & easy process, via the EventBrite link in your email, once qualified. We don't have staff to field calls or monitor Facebook messages or posts. 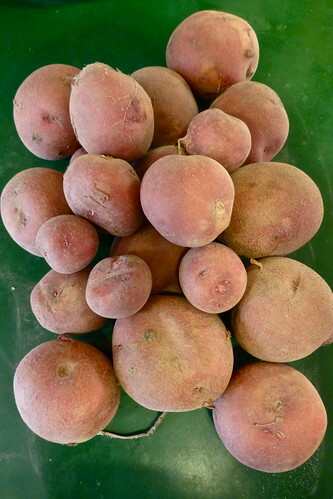 Send the pictures if you haven't," says Dan Keele. "It's a family event. Sociable dogs on non-retractable, short lines are welcome," says Keele. 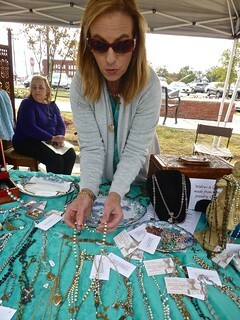 TAMF is about original or repurposed art and handcrafted goodies, plus food trucks, music and fun. "Stay all day. Visit, shop. See what life we bring to the Core of the City," adds Keele. 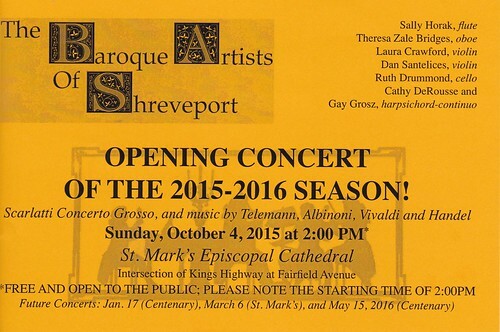 Saturday, November 14, 2015 from 10:00 AM to 4:00 PM. Canoeing, archery, hayride refuge tours, face painting, fish printing, and other nature-oriented activities. 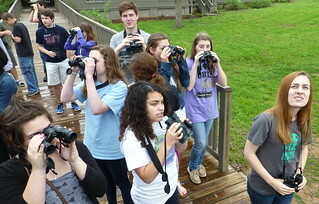 Seeing an eagle, native snakes, turtles, baby alligators and a young wood duck. It is the annual Refuge Celebration and Open House on Saturday, Oct 17, 9 am to 2 pm, at Red River Natl Wildlife Refuge, says Terri Jacobs. - New this year will be a skull maze. Visitors are given a mammal skull to identify by walking the maze. 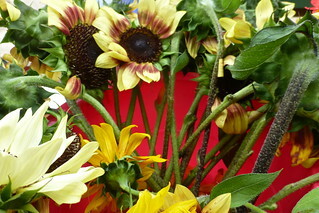 - A guided native plant walk starts at 11 am. - A nature photography program, titled "Birds, Bugs and Beasts of Red River National Wildlife Refuge" will start at 12:30 pm in the Education Center. - The new Nature Discovery Outdoor Play Area, designed for children ages 4 through 10 years old, will be open to the public for the first time. Stepping onto the smooth, white vastness of the Remington Suite roof recently - it was the Louisiana Film Prize awards brunch - verified this location as one of Shreveport's most urbane aeries. And performing a set reminiscent of the Beatles on the roof of a London building on Mon at sunset will be the Highway Lions, an affable, bankable group of seasoned rock n rollers. These guys - Daniel Goodwill, Chris DeRosia, Michael Cherene and Steven Emery - consume Dylan for breakfast, Petty for lunch and spend two out of every three evenings bathing in the Flaming Lips. 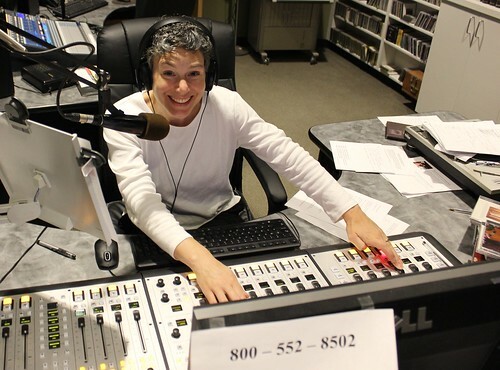 Sharing your cash with Red River Radio / Public radio: not easy? Easy? Go away? Sharing some of your hard earned cash with public radio is not an easy moment. But for me KDAQ / Red River Radio is a serious quality of life aquifer. Would you rather contribute or would you rather do without it? Keep Kate Archer Kent busy, eh? By the way and to be sure, there are numerous material incentives. "Free show at Big D's BBQ this weekend. I am playing and so are my friends! All kinds of music. 4 pm-12," says edm mixer, trickster Sasha Sosin, aka Action. His melodies and textures are being thrown down about 8:15, says Action. "Hi! 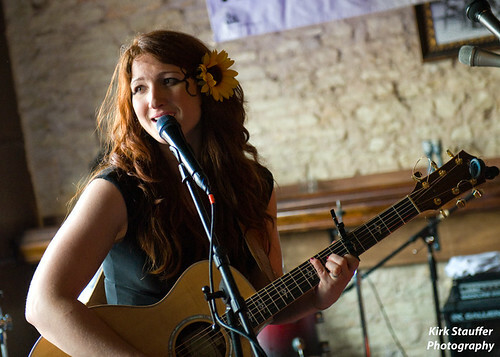 I'm crossing my fingers that you might be able to make it to my little show at Shreveport House Concerts this Sunday, Oct 11, 7 pm," writes Austin and Seattle-based singer Alyse Black. "People frequently say that my music "sounds like falling in love!" What a sweet thing to say, right? It's something like a cross between Brandi Carlile, Billie Holiday and Adele. Things have been taking off like crazy this year, and I have to pinch myself pretty often to remind myself it's real." The multi-instrumentalist charmer ends her note, "Anyway, I hope I get to meet you and give you a big hug Sunday!" The mystic Meadows vibe began with sequined voudou flags and maps in the Haitian art display. They are dimly lit so as to preserve the fabric. Does the quiet light remind the viewer of the low lumens typical of artists' shops in the old quarter of Port au Prince? Sitting cross-legged on the carpeted floors was what this artist found most comfortable in the 2 upstairs exhibits. In a dark room is a digital exhibit of subtle action and form - New Orleans artist Courtney Egan has installed captures of flowers of the Crescent City and caught them in intimate action. The metamorphoses are accompanied by appealing, wee sounds. 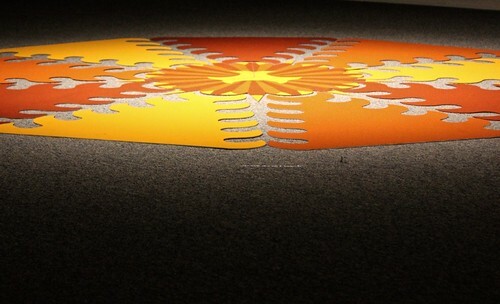 Symmetric mandalas made of vivid plats of spices filled 2 rooms in Meadows and another room at Turner Art Center across Centenary Blvd from Meadows. It is an exhibit by artist Stephen Watson. While he is not a Tibetan Buddhist monk, Watson is most assuredly inspired by Tibetan sand sculpture. His designs present a powerful marriage of color and form, some of them reminding me of Matisse cut outs. 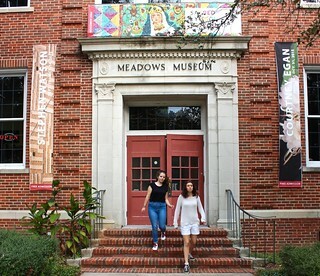 Meadows hours have been extended under the new directors: Tues - Fri, 11am-6pm and Sat, noon - 4pm. Lecture by Dr David Otto on Sat, Oct 10, 1 pm: "Mandalas: Their Meaning and Use" at the Meadows - in conjunction wi the art of Stephen Watson. SciPort Shreveport presents International Archaeology Day on Sat, Oct 17, 10 am to 2 pm, says Ann Fumarolo. Tad Britt, Chief of Archaeology and Collections with the National Park Service’s National Center for Preservation Technology and Training, Natchitoches, La, will give technology demonstrations involving a PXRF – a hand-held x-ray machine used to identify the elemental composition of an artifact – and other technologies including an infrared camera and microscope, under which visitors can view sections of artifacts like stone tools and ceramics. Dr. Robert Z. Selden Jr., Stephen F. Austin University, will demonstrate 3D geomorphic scanning techniques involving ceramic Caddo artifacts like bowls, pots and bottles. Sci-Port visitors are encouraged to bring artifacts from home for identification by archaeologist Jay Gray of Cultural Resources Analysts, Inc. Gray will analyze items such as arrowheads, kitchen tools, hardware and remains of goods left behind by pioneers. Archaeology Day activities are free with regular Center admission. Above: Curtis Bias pot in homage to Caddo design. 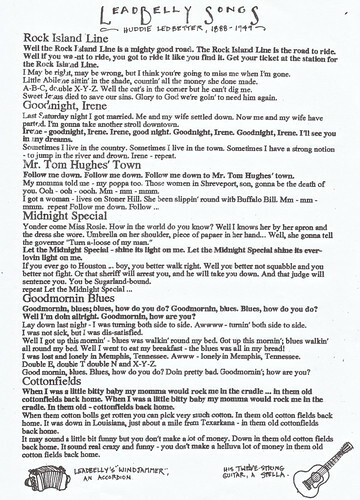 Not About Nightingales is a three-act play written by Tennessee Williams in 1938, says Wikipedia. A group of inmates go on a hunger strike in attempt to survive cruel treatment. Eva, the new secretary at the prison, is busy avoiding the Warden's advances and falling for Jim, an inmate. Williams gained inspiration for the play after reading newspaper accounts of inmates who suffocated in a steam room in a Pennsylvania prison. Although the play was originally written in the 1930s, it wasn’t discovered until the late 1990s when Vanessa Redgrave made it her personal mission to track it down. Directed by Assistant Professor of Theater Logan Sledge, Not About Nightingales will run at Marjorie Lyons October 8-10 at 7:30 p.m. - with a 2 p.m. matinee on October 11. Above: Aiden Poling as Jim, John Bogan as Whalen. More photos. 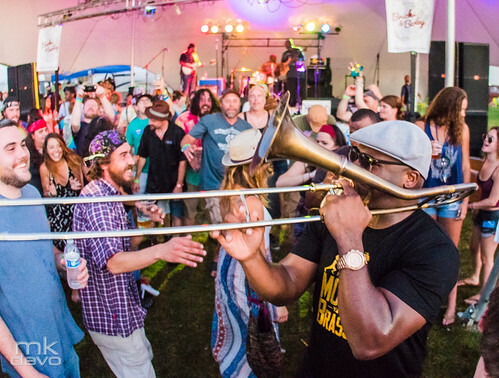 Crescent City cut-ups devoted to the art of funkily fanning the flames of flying flip-flops on Friday night at the Revel: Big Sam's Funky Nation. Introduced to Shreveport, as far as I know, by Bears Fairfield, this quintet does everything a thumping New Orleans band must do. 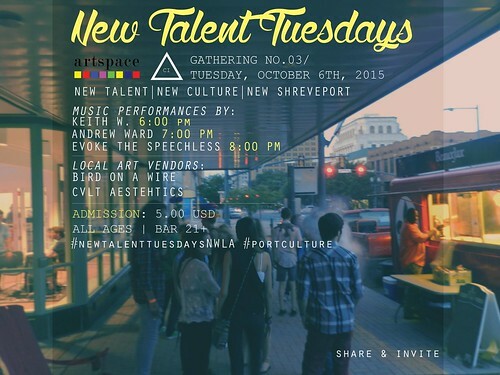 New Talent Tuesdays at Artspace Shreveport: send your best emissaries to watch talent grow like hearty weeds between the cracked walls of the Texas St buildings. 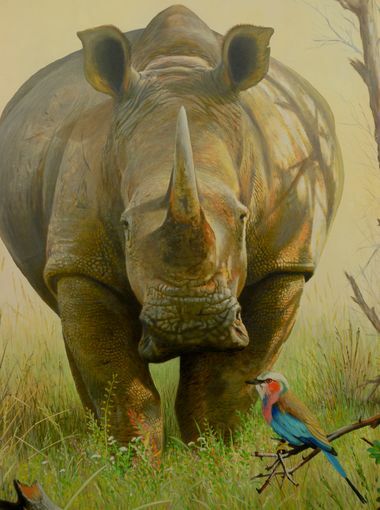 Rainforest Art Foundation presents work by naturalist, photographer and wildlife artist Don Edwards, says Stephanie Yu Lusk. Edwards has traveled to Colorado's Rocky Mountains, Wyoming's Grand Tetons, Yellowstone, Alaska, and been aboard three trips to Africa, including visits to the Masai Mara Game Reserve in Kenya and Kruger National Park in South Africa. Voting for their favorite Don Edwards painting in the “Walk on the Wild Side with Don Edwards” exhibition (excluding the Duck Stamp painting) will put patrons in a door prize drawing. The winner will choose a 20” x 30” canvas giclée of their choice valued at $450, including frame. 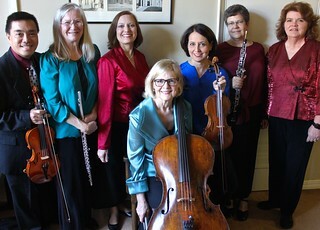 A septet of professional players awaits their audience at St Mark's Episcopal on Sun, Oct 4, 2 pm. Sit as close to the musicians as possible to enhance the clarity of these articulate performers. No fee. Sponsors have subsidized the series. Filmmaker Austin Alward has directed an 11-minute movie about a seven year-old adopted girl and about bees. 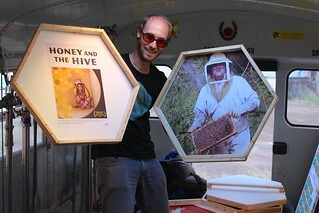 It is called "Honey and the Hive" and is being shown this weekend as one of the 20 competitors in the La Film Prize. 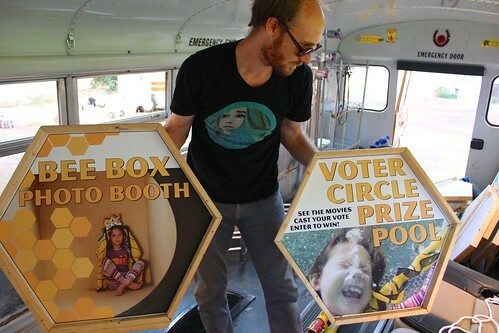 He has also created a center for bee-related games - Bee Hive Corn Hole, for example - at 516 Texas St inside a decorated, winged school bus called the Bumblebus. Those who like what Alward is doing with bees and his poetic, charming movie may want to purchase a discounted ticket to the LFP viewings - so that, if you watch all 20 movies, you can vote. Viewers' votes comprise 50% of the score in the LFP.